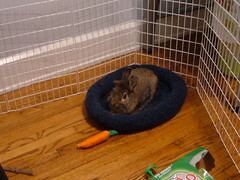 Kim and Cocoa: Cocoa in his bed!!!! Wow, I haven't posted in a while! Cocoa finally laid down in his bed tonight and it was so cute I had to get a pic. I bought him the bed a month or so ago from Petco. The bed is in his playpen area. Cocoa always jumps in there, but never stayed too long. Tonight I caught him sleeping in his bed. It was the cutest thing ever!!!!! What a sweetie! How old is little Cocoa? He looks happy and small! We need more info and pictures of Cocoa on your post! Maybe someday Cocoa will be a Disapproving Rabbit.